Olden but golden. Without a USB Type-C or Thunderbolt 3, the 2017 model of Microsoft's Surface Pro seems kind of dowdy. The fanless operation we have already seen in Acer's Alpha 12, and unfortunately the device throttles noticeably. Is the only benefit left really its decent battery life? Positive: Decent processor; nice display; beautiful design; high autonomy; good cooling system. Negative: Only 4GB RAM; SSD only 128GB; expensive external stylus pen; no USB-C. Positive: Slim size; light weight; good hardware; nice display. Negative: High price. Positive: Impressive design; solid workmanship; metal case; light weight; compact size; nice display; good hardware. Negative: No USB-C; relatively high price. Positive: Slim size; light weight; good display; decent speakers; long battery life. Negative: No USB-C; high price. 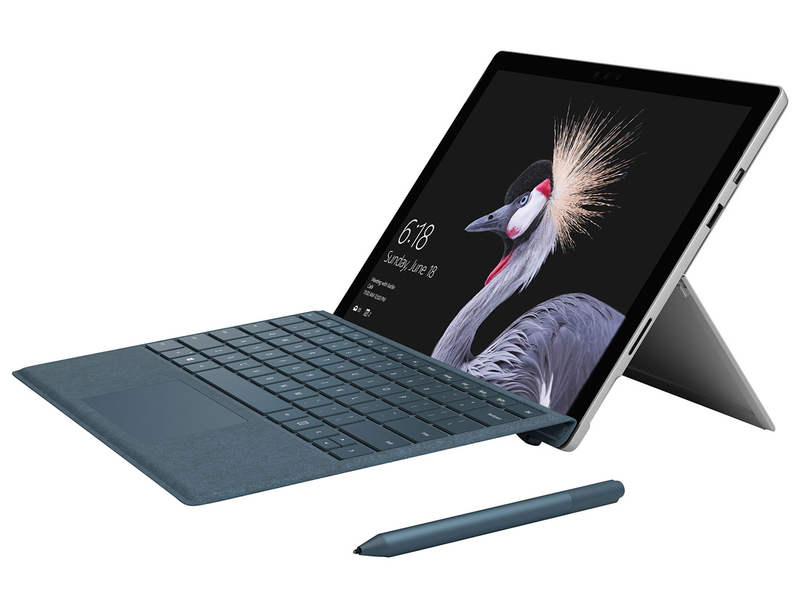 Microsoft Surface Pro (2017) is the fifth generation in the Surface Pro family. The Surface Pro is solid as a rock and exudes a sense of futuristic quality. It’s also well-designed, with a look and feels that, while minimally changed from the Surface Pro 4, is still an improvement. The corners are more rounded, and the exhaust vents along the edges are less pronounced. There aren’t many moving parts in the Surface Pro itself. The power and volume buttons along the top are easy to find by feel, and have a crisp action, while the kickstand is smooth and reliably holds the tablet at chosen angle. It now opens up to 165 degrees, an increase from the Surface Pro 4, which opened 150 degrees. Fully flexed, the kickstand can turn Surface Pro into a nearly-flat slate. If a user decides to flip into tablet mode for a moment and fold back the Type Cover, the keyboard will turn off when the cover is tucked back. It can even switch Windows 10 into tablet mode if desired. It attaches to the tablet with strong magnets and connects via a physical port, meaning there’s zero lag when typing. The Surface Pro sports two front-firing speakers on each side of the display. There are small cutouts in the glass to let the sound through, and the design provides impressive sound for a tablet. Music is great, with surprising range, and there’s even a hint of bass. The speakers also get surprisingly loud and can fill a decent sized room without distorting. The Surface Pro features up to a seventh-generation Intel Core i7, 16GB of RAM, and a 1TB SSD. It is seen that the Surface Pro offers a cutting-edge CPU, solid RAM and SSD options, and full support for all of Microsoft’s most innovative Windows 10 technologies. All that will keep the machine relevant for years to come. The Surface Pro is refreshingly light on bloatware. While it’s stocked with the usual Microsoft Windows 10 apps and a handful of casual games, it’s otherwise unencumbered with junk software. The Surface utility is also a nice app that offers the ability to configure the Surface Pen and get some useful information about your machine. Microsoft is using a 45-watt-hour battery in the Surface Pro, which is an increase from the 38 watt-hour battery that was packed into the Surface Pro 4. The Surface Pro also uses more efficient seventh-generation Intel Core processors. Taken together, the new model offers improved battery life over its predecessor. The Surface Pro is eminently portable, at 0.33 inches thick and 1.73 pounds. Even with the Signature Type Cover attached, the machine is easy to carry around and slip into a bag. It might not be quite as thin and light as the iPad Pro, but it’s also a much more powerful machine that can run real PC applications. The Surface Pro bring a whole new meaning to the word tablet. It is a iPad like device but is actually a real computer. 80.84%: This rating should be considered to be average. This is because the proportion of notebooks which have a higher rating is approximately equal to the proportion which have a lower rating.